I just got back from the Slow Food Taste Pavilions, and after four hours of some very serious grazing, I'm in no condition to do a proper post. Hopefully, after a Labor Day of rest and recuperation, I'll have some cogent thoughts to share regarding this extraordinary event. Here are a few shots from tonight's indulgence. Here's a little slide show of photos I took at last nights SFN'08's Taste Pavilion sneak preview. A select few VIP's (and myself) were invited to see an impressive array of organic, sustainable, and more importantly, delicious food products that are the edible centerpiece of this weekends event. Sorry for the less than detailed narration, but I wanted to get something up quickly, and only had a few minutes free time. Michele and I will be officially eating our way through the Taste Pavilion on Sunday evening, so stay tuned for much more. Today I'm off to the San Francisco's civic center for three different lectures from the Food for Thought program. 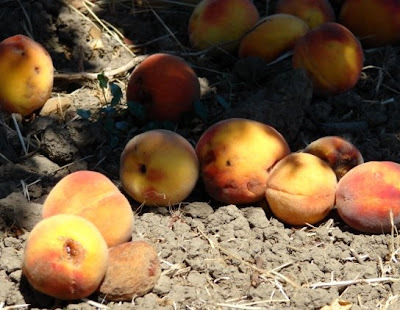 Speakers include Alice Waters, Michael Pollan, and Slow Food International’s founder Carlo Petrini. It starts tonight and goes throughout this long, and what looks to be very warm, Labor Day weekend. 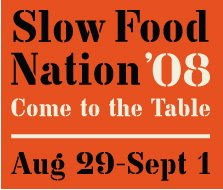 Here's the link to the Slow Food website in case you haven't heard about this potentially historic event. If you are in the area, there are many free, open to the public, events and exhibitions planned - so come on over - the revolution will not be televised, but will be catered. I am covering events Friday, Saturday, and Sunday, for this blog and others, so I'm not quite sure when articles, photos, and/or videos will be up. However, rest assured that I'll be sharing as much as I can possibly manage - as soon as I can manage. Stay tuned, and take it slow. If you are interested, here is a three-part video that cover the origins of the Slow Food movement. Most gastronerds credit Peru with giving us the marinated seafood salad called "ceviche," but I imagine that most coastal fishing cultures developed similar dishes. In fact, tuna poke, which is a very popular appetizer here on the West Coast, is a very similar idea. 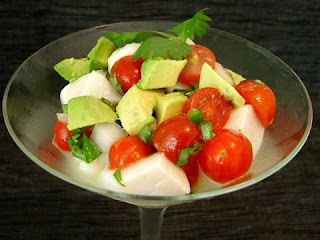 I've already posted one ceviche recipe on the blog, called "Bay Scallop and Mango Ceviche." It was originally posted to Youtube, where it caused a virtual riot among my Peruvian friends. Ceviche is their national dish, and they don't take kindly to people like me adding things like mango, and still calling it ceviche. Apparently, there is only one way to make ceviche, and no variations shall bear the sacred name, ceviche. I tried to defend myself with the usual, "it's my recipe, and I'll call it whatever I want." This only infuriated them more, and it almost turned into an international incident as I ignored their demands to change the name. While this recipe is much more traditional, I'm sure I did something wrong, and undoubtedly the title will be gently challenged. Enjoy! To me, the photo below really captures what this time of year looks and feels like. It also inspired the following haiku. There is something enigmatic about the haiku. Its strict 5-7-5 syllable structure somehow bringing an openness to the poem. I look forward to reading your submissions. 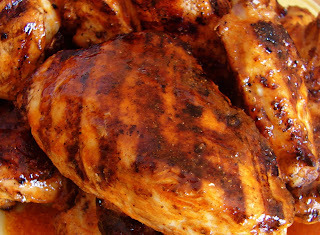 My non-fat yogurt kick continues with this yogurt and paprika marinated grilled chicken. The name in the title is an homage to one of the best chicken take-out joints in San Francisco, called "Good Frickin' Chicken." I've always loved the name, so I'm stealing it for this recipe. While this is a pretty straightforward grilled chicken recipe, the vinaigrette trick you'll see at the end was a last minute touch that worked out nicely. I really like oil and vinegar-based sauces on grilled meats. They work beautifully with the smoky, caramelized exterior. It's this part of the recipe where you can summon your inner chef and decide what oil, vinegar, and other flavorings you'll use to bath your chicken. I mention in the clip to use a fresh Spanish paprika to get the best results. The cheap, rusty-brown dust in the back of the spice shelf you use to sprinkle on the deviled eggs once a year is not going to cut it. There's really a major difference in taste and appearance - it's like using bacon bits instead of real crumbled bacon. You wouldn’t do that, would you? Enjoy. Gee, if I knew the reviews of RR's cooking skills were going to be so great I wouldn't have featured him! As you know, I work alone, but I guess I can share the spotlight for one more day. Here is something called Puerco Pibil, which I've never made, or know anything about, so I'll let Chef Rodriguez take it from here. Enjoy! 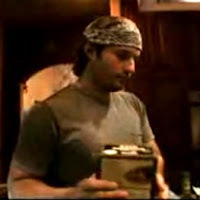 Robert Rodriguez Makes Breakfast - Finally, a Celebrity that Can Cook! While checking messages on YouTube, I got a tip about some cooking videos done by Robert Rodriguez, who directed such films and Spy Kids, and Sin City. I usually jump at the chance to post celebrity video recipes, like I did for Paul McCartney, and Christopher Walken. They are fun to watch, easy to ridicule, and usually generate some interesting conversation. But, much to my surprise (and slight disappointment) this Rodriguez guy can cook! He not only makes a great looking breakfast taco, but he makes his own tortillas. That's some serious cooking chops. Check it out. As many of you may know, Gorgonzola is Italy's delicious contribution to the worlds' great blue cheeses. 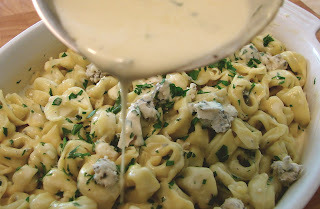 This Gorgonzola sauce recipe video, I recently produced for About.com, is about as simple a blue cheese sauce as you'll find. 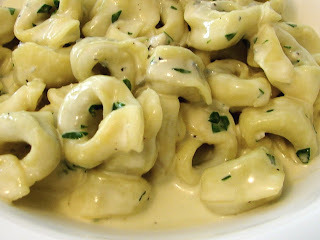 The complicated pastas I refer to in the title are the folded, shaped, and stuffed delicacies like tortellini, ravioli, and gnocchi. This rich and strongly flavored sauce works perfectly with those larger varieties, and their many nooks and crannies. When buying Gorgonzola, you'll see two varieties; Gorgonzola "Dolce" and Gorgonzola "Piccante" or "Piquant." I recommend the "Dolce" for this sauce since it is a younger cheese, and has a milder flavor. The "Piccante" is aged longer, isn't as creamy, and has a much sharper flavor. Having said that, I encourage you to buy a small piece of both and taste them before committing to one or the other. Crumble each on pieces of Italian bread, and put in a warm oven until it starts to melt. Enjoy! Is this a Juxtaposition, or What? This photo was taken the night of the Foodbuzz San Francisco food bloggers dinner. I'm posting it because I don't believe I've used the word "juxtaposition" in the blog yet. 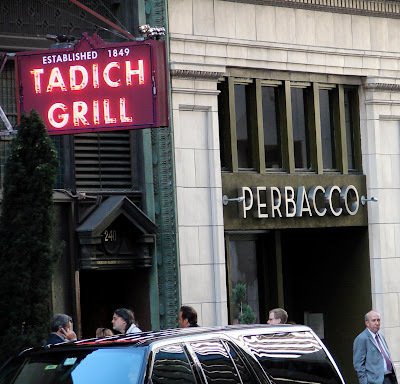 I like this photo because in one frame you have San Francisco's oldest restaurant, the Tadich Grill, right next door to Perbacco, one of the City's newest. The contrasts in colors, shapes, textures, signs, fonts, and materials are fascinating to me. As I snapped the picture I wondered if Perbacco will still be there in another 156 years? Jim just posted this comment under the "Calling All Foodies" post, but I wanted to make sure all you wise foodwishers got to see it. Thanks again for participating, it was a great exchange on the various philosophies of cooking. "Hello Everyone! Thank you for your amazing and insightful comments. You (and Chef John) have helped transform my thinking about cooking and food. What a difference my new attitude is already making in the kitchen. I am now back in touch with why I went to culinary school to begin with. Thanks again for your wonderful thoughts! 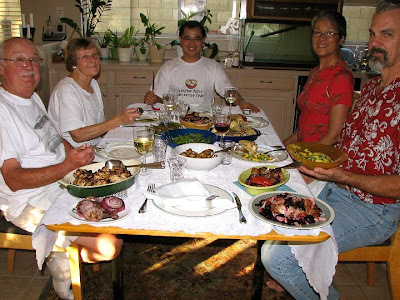 :) - Jim"
Tho X. Bui sent me this photo of him feeding five foodie friends a food wish feast. The menu included yogurt grilled chicken, a Cabernet-cherry sauce to serve with smoked turkey, and barbecued shrimp. Looked like a great meal, but what I enjoyed the most was the fact that he was wearing my "A Hollandaise can sense fear" t-shirt! You go Tho.